Wow, I can only imagine how much plotting went into the creation of this book. This is one hell of a psychological thriller. It is utterly unique with a cast of intriguing characters. This is going to be one of the most talked about books of 2018. Stuart Turton’s novel is a mind-bending piece of work. It’s hard to believe that this is his debut! As the novel opens, Dr Sebastian Bell finds himself in the grounds of Blackheath house with one word on his lips – Anna, he is screaming into the night. But he has no memory of what has befallen him before he arrived in this place. And as he becomes reacquainted with himself, he is presented with a task. 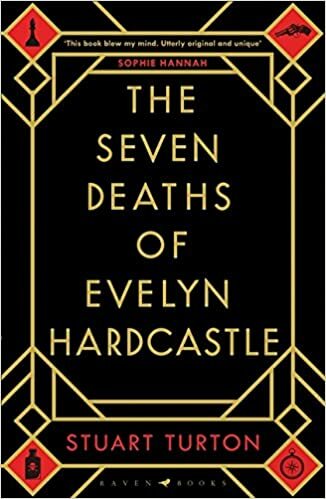 Someone is going to be murdered in the house tonight the daughter of the owner, Evelyn Hardcastle. To escape the house and find out who he truly is our lead character must solve her murder, but he has eight rivals, and only one of them will be freed. And until one of them can discover who kills her, the day will repeat itself over and over again. Stuart opens the story with plenty of intrigue both for his main character and the reader; I found this such a fascinating idea as his character is finding out information about himself the same time the reader is, it was fascinating to see his reactions to revelations about his own past. Our main character, Aiden Bishop, who has come to Blackheath to solve Evelyn’s murder, becomes attached to one particular character which proves tumultuous for his time at Blackheath. I had no idea where this story was going to go. When I first started reading this book, I was worried that I was going to find the story hard to follow, particularly as the plot of the novel is so complex, and Stuart packs a lot of information into this book about the characters and their murky pasts. But I really didn’t have any trouble at all in understanding the plot, and I didn’t have any difficulty in keeping track with the character changes. Stuart’s writing is utterly absorbing as he takes the reader into the heart of Blackheath. There is a race against the clock element to the story as Aiden races to solve the murder ahead of those he is competing against. The difficulty here is that he does not know who he is up against so it isn’t a case where he can work out their weaknesses or even work out the strength of his own position. The ending of this book has left me wondering if perhaps there is a sequel in the works. I would love to find out more about the characters, and it would be fascinating to see how Stuart would choose to visit this world again if he decides to do so, I don’t think your mind will ever quite leave Blackheath once you have finished reading. Thank you to the publisher and to Netgalley for providing me with a copy of the book to read. I’m so glad you enjoyed this one and didn’t find it too hard to follow (one of my concerns) as I have this coming up soon and I can’t wait now! There could be a sequel? That’s interesting news. I already thought you’d love it, it seems everyone does :-). I think it’s one of the books highest on my wishlist! Great review! Thank you, I’m not sure if there will be, but the ending definitely left it open to the possibility of a sequel.